This project highlights the beauty and elegance of Sonoma. The golden hillside and Meadow Oak trees of the borrowed landscape provide inspiration and create an incredible backdrop to spaciousness. Our challenge was to design and plant the beds around the existing hardscape. We orchestrated blending color, texture and the feel of the area to create a warm and lush garden with low water needs. Envisioning a landscape design when fully grown in takes a unique leap of faith for both designer and client! Here is an excellent example of what one year in the life of a planted bed reveals. The lush grasses are starting to catch the wind. The bulbs are blooming profusely while filling in the mid-level niche. The sedum carpet is almost inching its way to total coverage. What started as a vision has grown into a fused design. This one of a kind teak sculpture softens the space around this corner. The plantings bridge the grass steps to create continuity. Pops of color and texture finish the space and infuse accents to a naturally neutral palette. 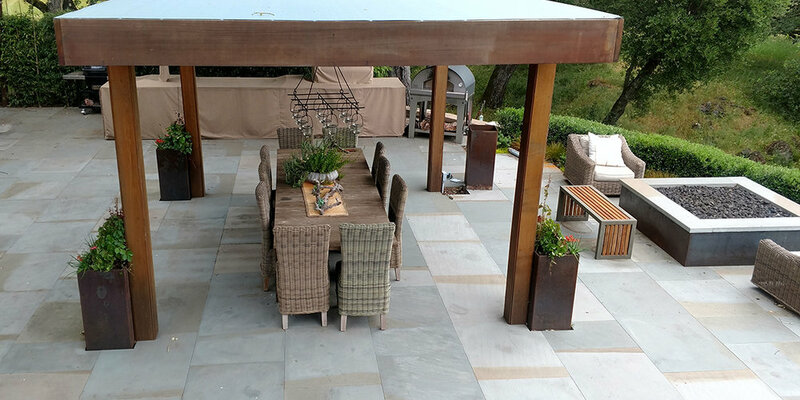 Adding color to a patio through a partnership of metal steel, stone, and plants. Tall and sleek, featuring a rusted patina finish and modern design, the planter is ideal as a patio accent. Crafted from a thick gauge, fully seam welded COR-TEN® steel base, all planters are proven to resist weather related issues such as cracking in both winter and summer months. Warm colors echoed in the plants within the planter contrast well with the gray of the siding and the blue-grey of the stone. Imagine a meal alfresco under this arbor as the natural element weaves its own way into the design. Planting the structural edges with vines, the Boston Ivy will trail up and soften the edges of this beautiful arbor. A bonus will be to tuck in fall color and connect the design through to the front walls in the entry way.